I’m not a big comic con person. I’ve been to San Diego’s famed convention a few times, but haven’t been to many other than that. 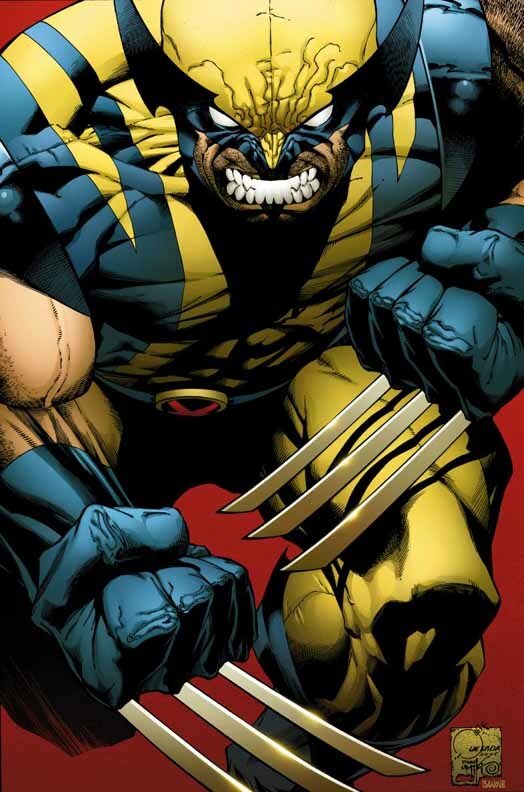 In fact, despite the subject matter of my blog, I’m not really a comic book geek at all, or at least in terms of sharing a lot of the “truisms” that comic book geeks are supposed to have. Most of my friends don’t read comic books, I don’t play video games, and I watch as many independent art-house films as I do big budget sci-fi films. I also have personal hygiene, have basic social interaction skills, and have actually known the touch of a woman. Ha! I kid because I love. But I do love comic books. I love them, and I love talking about them, and I’m even working on writing them. And so I trekked down to Seattle’s Emerald City Comicon yesterday, along my good friend and writing partner, Jay. My wife came along for the ride, but spent the day shopping, and ogling the good-looking shoe sales guys at Nordstroms. As I’ve said, I’ve been to the San Diego Comic Con several times, and while I found it exciting, I can’t say it did much for me from a comic book perspective. I did get some nice sketches, and saw some crazy movie panels, but it’s not creator friendly, and to be honest it’s a little soul crushing. I was pleasantly surprised to see that Emerald City was quite comic book focused, and at least from my perspective, seemed to be a lot more creator friendly than San Diego is. Geek culture was prevalent, however, in that there was lots of cosplay, lots of people who still can’t over the fact that Firefly was cancelled, and excessive line ups for TV “stars” that aren’t famous enough to even make the janitorial crew at the medical centre where Celebrity Rehab is filmed. Random character that I don't care about. 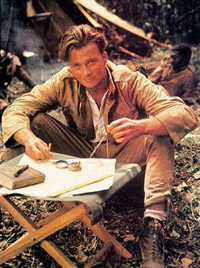 Apparently, this guy was Indiana Jones. And so it goes. As I said, Jay and I spent the day on the floor, except for a brief spell where Jay decided to stalk the guy who played Indiana Jones. No, not that guy. The other one. No, not that one. The guy you’ve never heard of. Right. I brought in a few books to get signed by creators that I knew were going to be there, but line-ups deterred me from following through on this for the most part. They weren’t that long, I just didn’t feel like standing in them. However, I did get books signed by Matt Kindt, Ethan Nicolle, and Ben Templesmith, so it still worked out all right. Jay is better than this than I am, mostly because a) he has freaky luck in picking the exact moment where no one else is bothering the person, and b) he’s actually a friendly, engaging person that people aren’t terrified of when he says hi. So he’s very much unlike me, and 98% of the rest of the people who go to these things. And so he got signatures by Greg Rucka and Geof Darrow. In terms of original art, I got a nice little sketch of Hellboy by the writer/artist of Icarus, Ryan Cody. 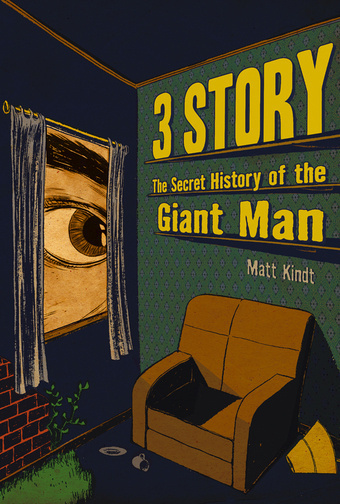 The big prize for me was buying an original piece of art from 3 Story: The Secret History of the Giant Man, by one of my current favourite creators, Matt Kindt. Jay won out on this as well, as he commissioned Matt to do a truly amazing piece for him. Jay picked Indiana Jones as the subject, and so Matt complied and the results were incredible. called Jan’s Atomic Heart by Canadian Simon Roy; Two The Incredibles trades by Mark Waid; The Solomon Kane: Death’s Black Riders TP (I also got writer Scott Allie to sign this); the TP of a mini called Olympus, also signed by writer Nathan Edmondson; the first issue of Icarus, signed by creator Ryan Cody; and a copy of Mephisto And The Empty Box, which is the only graphic novel by Matt Kindt that I didn’t own. Awesome for me! Oni Press Booth – In terms of the bigger companies, these guys were the most helpful, and the most engaging. The guy running the booth really went out of his way to talk to us, and gave us the low down on some my favourite Oni titles, like the Sixth Gun, Wasteland, Stumptown, and Guerillas. According to him, putting out books on time is his top focus this year, and so their new policy is not to solicit books that aren’t completely done. Also had a short talk with Brian Hurtt, artist of the Sixth Gun, and he told us that the book is on track, and that they’re continuing to work on it for the forseeable future. 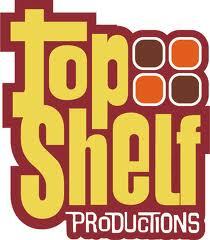 T op Shelf – I’m a fan of Top Shelf in general, and although they’re small, I think that they put out a nice cross-section of stuff. I asked about when the next installment of League Of Extraordinary Gentlemen was coming out, and was told this summer for sure. Uh huh. Had a nice conversation with J.D. Arnold, the writer of BB Wolf And The 3 LP’s, about the blues, and the incredible art work of Rich Koslowski. The only negative thing about this booth was that when both Jay and I complained that both copies of a book that we own are falling apart, we were given explicit instructions as how to fix it ourself. No offer to exchange the book, or refund our money, but rather a how-to guide on book binding. Good if you’re a 19th century homesteader, I guess, but not what we were looking for. 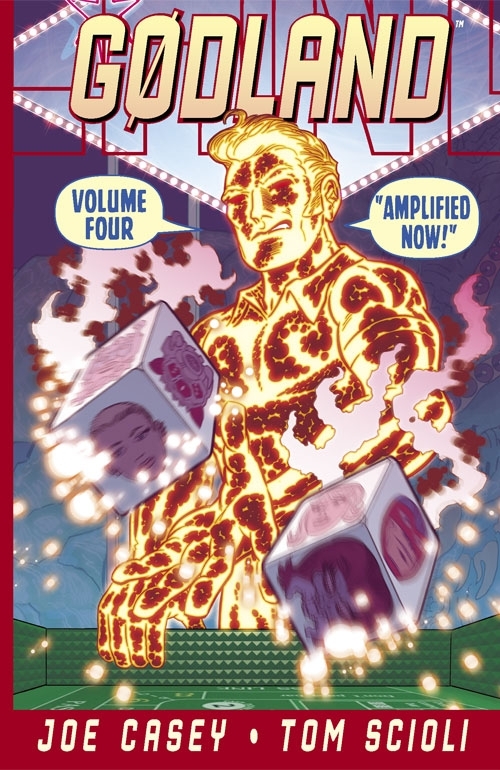 Dark Horse, and DC – Meh. Not much going on here, and I’m not really sure why they bothered putting up booths. The Image booth – This was probably the most fun we had at the con. Had some really great conversations with people like John Layman (the writer of Chew), Nathan Edmonson (the writer of The Light, and Who Is Jake Ellis?, and Jay Faerber (writer of Noble Causes, and what looks to be a really interesting new crime book called Near Death), and Jim Zubkavitch (writer of Skullkickers). I think that working these kinds of things can be hell for up and coming creators, and so the impression we got is that they enjoyed talking to people who actually knew and appreciated their work. Got some great tips on networking and writing, and some cool peeks into what they were working on in the future. We also spent some time talking with Cameron Stewart, the creator of Sin Titulo. He confirmed what had been reported by Rich Johnston of Bleeding Cool.com, that he will probably be putting out Sin Titulo in hardcover form sometime in 2012. Very friendly and engaging guy. He also seemed to appreciate talking to people who have read something that was so obviously near and dear to his creative heart. Probably the most rewarding time we spent there was in talking to the writer/artist Matt Kindt. Both Jay and I are big fans of his, and seeing him be so kind and generous with his time was awesome. He told us a bit about some of the projects that he’s working on, including an upcoming spy comic for Dark Horse, and a sequel of sorts to Super Spy. So all in all, a rewarding trip. Although I did like the comic book focus, I was still surprised at how few small comic publishers were there. I know it’s Seattle, and the little guys probably have to be pretty choosy which cons they go to, but still. That being said, it was still great to see so many people enjoying the medium I love. This entry was posted in Comic Books and tagged Comics, Dark Horse, DC, Greg Rucka, Matt Kindt, Oni, Top Shelf. Bookmark the permalink.